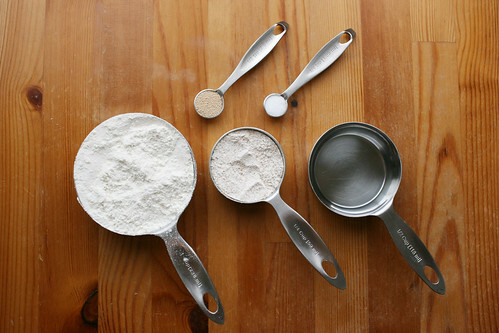 Combine the flours, yeast, and salt into a small container (we use a 1.6-liter/1.7-quart saucepan.) Pour the water over the mixture. 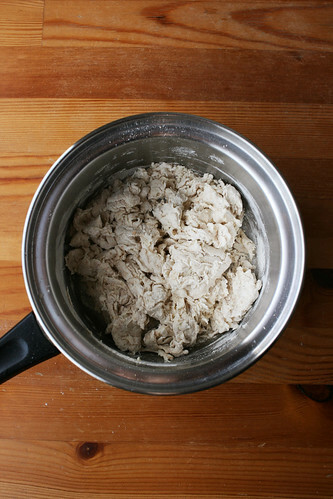 With a wooden spoon, mix until the ingredients begin to combine and the dough becomes scraggly. Reach in with wet hands and gently mix until all of the flour is incorporated and there are no dry patches. You might need to wet your hands a few times but be careful to only introduce as much water as you need to get rid of the dry patches. Cover the container with a lid that is not airtight (or loosely with plastic wrap). 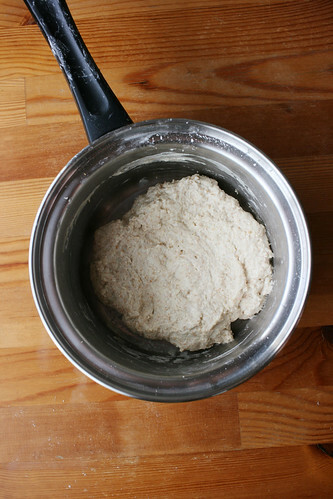 Allow the dough to rest at room temperature until the dough rises and collapses or flattens on top, around 5 hours. After the rising period, move the container to the fridge. 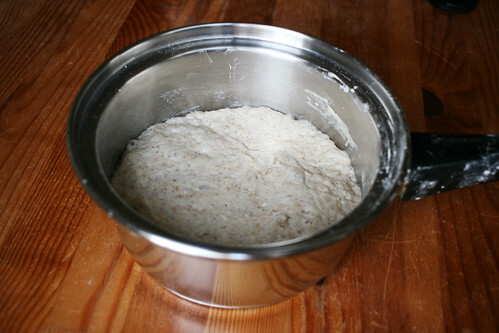 Store the dough in the fridge with the lid that is not airtight (or loosely covered) for up to 14 days. It is normal for the dough to fall slightly in the fridge. The dough can be used right away after the initial rising period but it is very sticky and difficult to work with. It is much easier to work with it after it is refrigerated overnight. Chop the tomatoes into small chunks and retain any juices. Transfer to a small saucepan and stir in the garlic, basil, bay leaf, dried oregano, freshly ground pepper, and, if using, red chili pepper flakes and red wine. Simmer the sauce over medium-low heat, stirring occasionally, until it reduces, about 30 minutes. You can slow cook the sauce for as long as it takes you to prepare the dough and toppings, but keep an eye on it and remove it from the heat if too much of the water starts to evaporate. Break up the mozzarella into small chunks and set it on a paper towel so that it absorbs some of the moisture. Prepare the surface on which you’ll roll the dough with a generous dusting of cornmeal and flour. We use a wooden cutting board. Prepare also the baking surface with a generous dusting of cornmeal and flour and keep it away from the heat (ie. don’t store it on the oven). If you want a thicker crust edge, like we do, lift the rolling pin as you reach the edge. 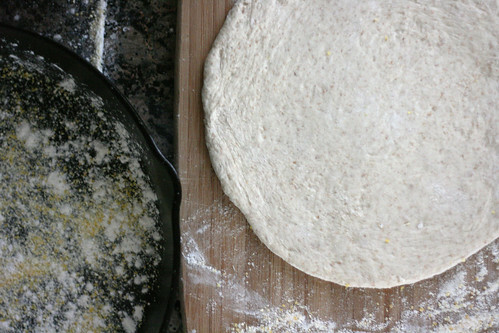 If you want a flatter crust edge, roll the dough past the edge. If the dough is being stubborn and shrinks too much, put it in the fridge for a couple of minutes and then return to rolling it. If any holes develop, pinch them closed with floured fingers. Place the rolled out dough onto the cooking surface. I just use my flour-dusted hands to lift it into the pan. Once the rolled out dough is placed in the pan, dust the edges with some flour. It is now time to dress the pizza with the tomato sauce and the mozzarella. 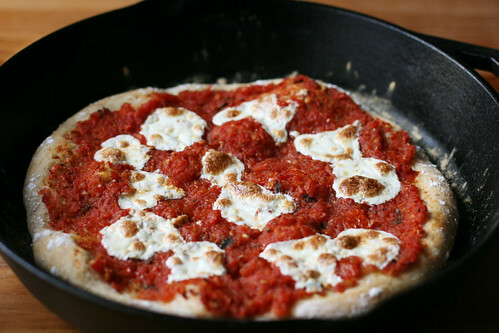 Spread the sauce out evenly over the dough, leaving a 1/2″ border at the crust edge. Distribute the mozzarella evenly over the sauce. Move the pan to the preheated oven, place it on the middle rack, and bake until the crust is slightly browned and the cheese is bubbly and brown, about 17 minutes. While the pizza is in the oven, prepare the rest of the toppings. 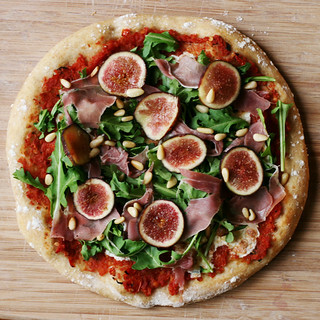 The arugula, prosciutto, and figs should be at room temperature when the pizza is ready to be dressed, so allow them to reach room temperature while the pizza is in the oven. Toast the pine nuts over low heat in a toaster oven (or in a dry pan on the stove) until they are warm and slightly browned. Remove the pizza from the pan by lifting it out with a large spatula or two. Place it onto a cutting board and allow it to cool slightly before dressing it with the remaining toppings. 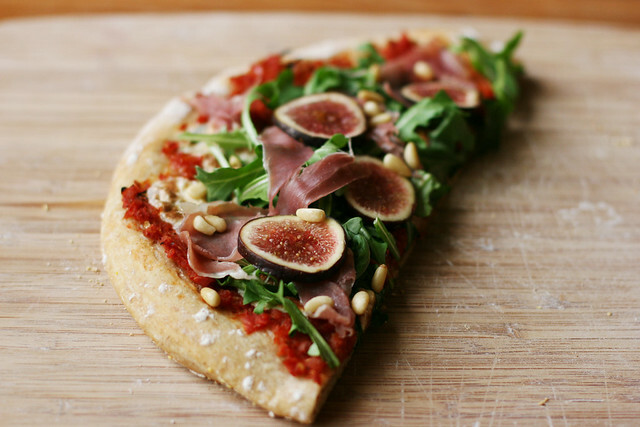 Distribute first the arugula over the sauce, then the prosciutto, figs, and pine nuts. Once the pizza is dressed, you can cut it. Using a large knife, cut it into slices by pressing down and then lifting the knife rather than dragging it across. This will give you neater slices and won’t cause the ingredients to be dragged off the pizza. 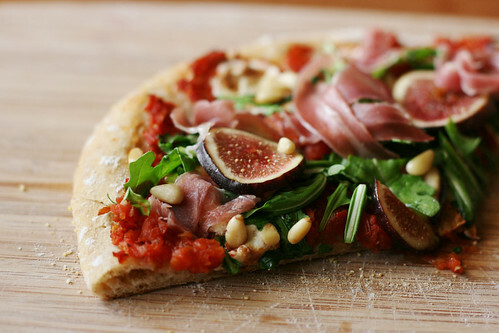 You can use just one slice of prosciutto for the whole pizza, half a slice per serving. 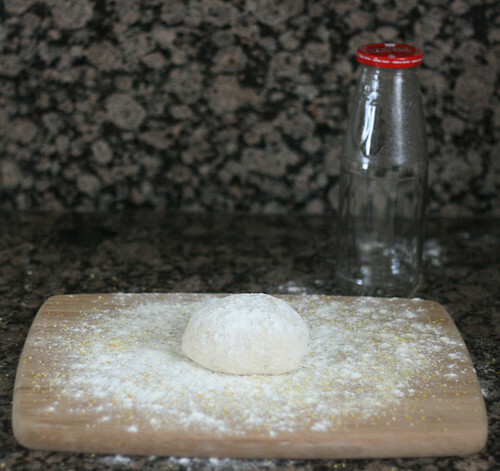 The dough can, according to the authors of the book from which I adapt the recipe, be made without any salt whatsoever. If we weren’t worried about our sodium intake, we would add more salt to the dough (1/4 teaspoon) and we would also add a pinch of salt to the tomato sauce because tomato dishes can generally benefit from a little bit of salt. If you’d prefer to use canned tomatoes, cubed, crushed or pureed tomatoes all work well. You likely won’t need to reduce the sauce as long and can use about 250ml (8oz) tomatoes. Just be very careful to choose a can that has either no salt added or a relatively small amount of sodium. Canned tomatoes sometimes have an astronomically high amount of salt added. If you choose to add toppings to your pizza before you put it in the oven, it could affect the overall cooking time. Adding mushrooms and shrimp, our two other favorite pizza toppings, changes the amount of time it takes for the pizza to cook to about 20 minutes. We didn’t have a 12-inch cast iron pan when we first started making pizza and we made it in a cookie sheet instead. Ours are fairly heavy duty. We baked the pizza for about 15-16 minutes until tomato sauce started to bubble and then turned on the broiler for another 2-3 minutes, until the cheese browned. If you have regular cookie sheets, double them and check on the pizza earlier. Please note, however, that most cookie sheets aren’t made for the high temperatures needed to make pizza so you’ll probably end up discoloring them, burning off the non-stick coating and end up with designated pizza-baking cookie sheets or ones for which you’ll need to use lining to use. We have this preseasoned skillet which comes with a handy silicone holder to protect your hands from burns. If the pan is no longer less expensive if you buy it with the holder and you end up getting a holder separately, get it in black. Our red one has blackened at the edge from the high heat. We use this massive turner to transfer the cooked pizza onto the cutting board. We’ve had the cutting board that’s been making appearances on this blog for five years, and if you look too closely at my pictures, you’ll realize it needed to be replaced, badly. I couldn’t find the same one again, but I recently got this thinner version which also comes with two adorable tiny cutting boards. Hand-wash only and oil occasionally to make it last and help prevent splinters.